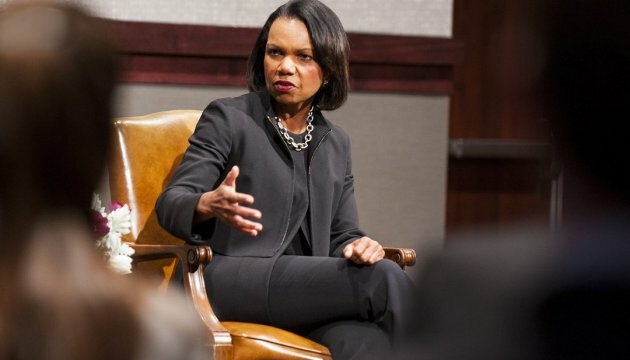 Former U.S. Secretary of State Condoleezza Rice has said that the United States should assist Ukraine and strengthen its security, but at the same time the Minsk agreements should be observed as much as possible. "I certainly believe that we should help Ukraine to defend itself, I believe that people should have a possibility to protect themselves with the help of small arms, although the U.S. government has not chosen this path, and I understand it," Rice said in an interview with ICTV Channel. According to her, the Minsk agreements are constantly violated by Russia, but sanctions and oil prices have their effect. "It is obvious that the Minsk agreements are constantly violated, but we should be patient and hold own position. Sanctions, together with low oil prices seriously damage the Russian economy,” Rice said. She also added that Ukraine should carry out economic reforms, and the government should apply all the efforts for this.